Was this a new turtle site or one that had been established for quite a while that we hadn't noticed? Many times a day we scan the ocean with binoculars. 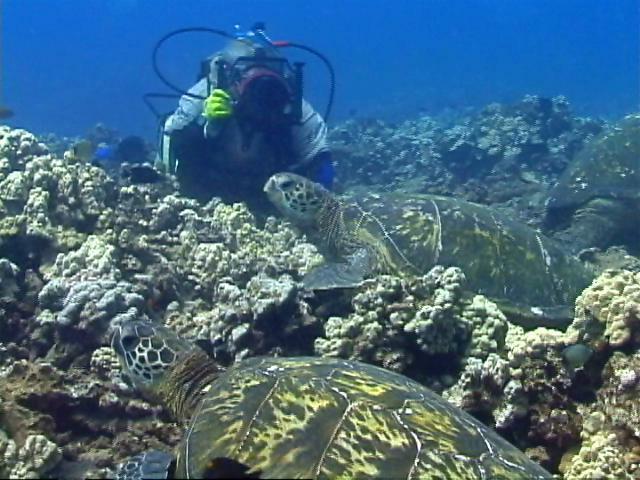 From our vantage point we can see turtles surfacing over our entire dive site. Last summer, we were surprised to see "shells" poking up to the north. We were baffled by this. Was this a new turtle site or one that had been established for quite a while that we hadn't noticed? We speculated that perhaps shy turtles using the Turtle House were leaving when we approached and settling at the northern site instead. When we returned this summer, however, we scanned the ocean before our first dive and saw the "north shells" again. Clearly, our visits to the Turtle House did not explain the origins of the northern site. We were interested to note more turtles surfacing at this site than at the Turtle House. It was time to find "NorthHouse". On the morning of July 7th, we headed north instead of to the Turtle House. and--voila! We came upon a high crested coral reef and "Mount Balazs", a large coral outcropping poking out of the sand bottom. "Mount Balazs", a large coral outcropping poking out of the sand bottom. Near the outcropping, six turtles rested. Four left, and two calmly watched our approach. We were delighted to recognize one of them. Kamaha'o was a juvenile with fibropapilloma when we first met in 1993. Now, six years later, Kamaha'o is a robust subadult free from disease--our only juvenile regression case. Kamaha'o is a robust subadult free from disease--our only juvenile regression case. 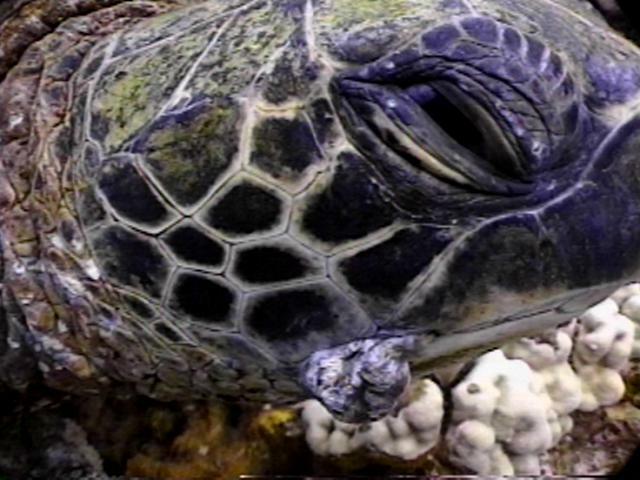 Also, we want to find out what percentage of honu use all three sites: NorthHouse, Reef 2, and the Turtle House during the course of a summer. NorthHouse and Mount Balazs have added an exciting new dimension to our diving--and also much more of a challenge to our air supply. It's eleven minutes longer to get there when currents are running! 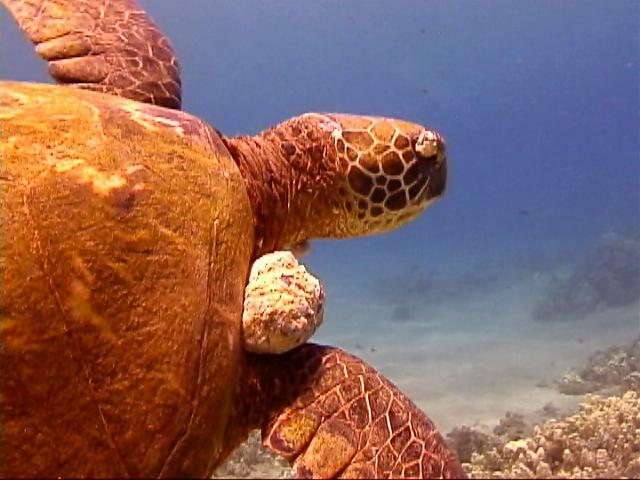 Thus far in 1999 we have identified 55 honu. 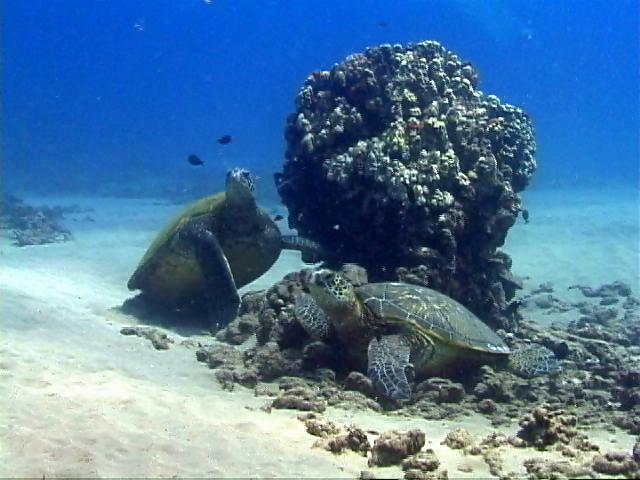 These include turtles sighted by George Balazs on his dive trip of January 21st. George sighted fourteen turtles, of which eight (57%) have been sighted by us in previous years. While we do not have the equipment to do a thorough turtle inventory, we can present some "preliminary" numbers. 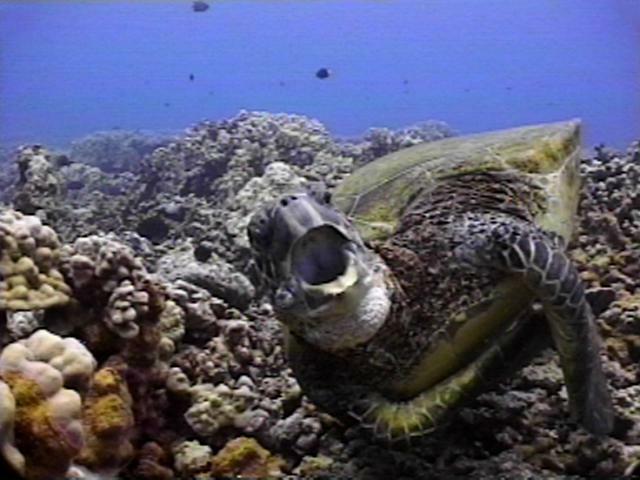 Of the 55 honu we've sighted in 1999, twenty-eight (51%) are resights. The longest residency we can report is that of Kaula, who has lived at Honokowai since 1989 when we first sighted him. The longest residency we can report is that of Kaula (front), who has lived at Honokowai since 1989 when we first sighted him. We believe that once we get back to Canada and have access to our photos, the 51% resight number is sure to grow. 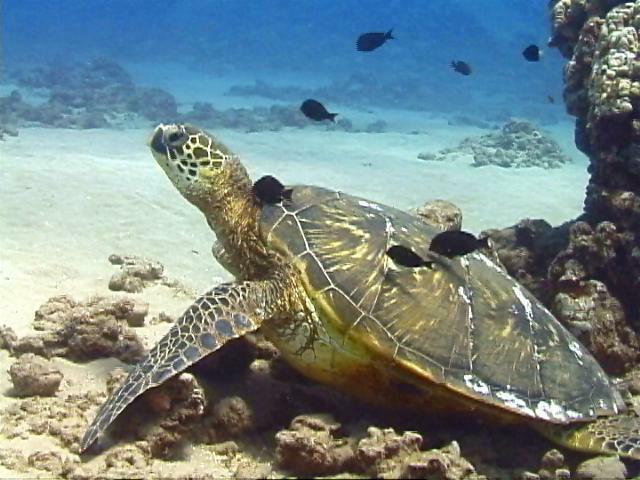 Right now, though, we know that 51% or half the honu we see are turtles we've seen in other summers. Polzbarney used to spend much of his time under his favourite ledge. We were saddened to find his spot empty on most of our dives. He appeared nervous around us and we speculated he still remembers his captures last August and most recently in January. Regardless, we managed to document Polzbarney's condition this week and his condition is sad indeed. The tumor on his right shoulder, barely visible in 1997, has now mushroomed to an obscene size. The tumor on his right shoulder, barely visible in 1997, has now mushroomed to an obscene size. If Polzbarney follows the fibropapilloma "schedule" of other juvenile turtles, the summer 1999 will be his last on this reef. This male honu (whom we've known since 1996) took exception to having his picture taken, so he let loose with his fiercest crabbiest yawn. This male honu (whom we've known since 1996) took exception to having his picture taken, so he let loose with his fiercest crabbiest yawn. We welcomed this because it allowed us to look inside his mouth and determine that the tumor he carries on the right does not extend into his throat. Add the puckered look of this mouth tumor to the small dark gray tumor in the posterior of his right eye and this is a lucky turtle! Add the puckered look of this mouth tumor to the small dark gray tumor in the posterior of his right eye and this is a lucky turtle! A regression case... one of four new ones we've documented in 1999, all males. 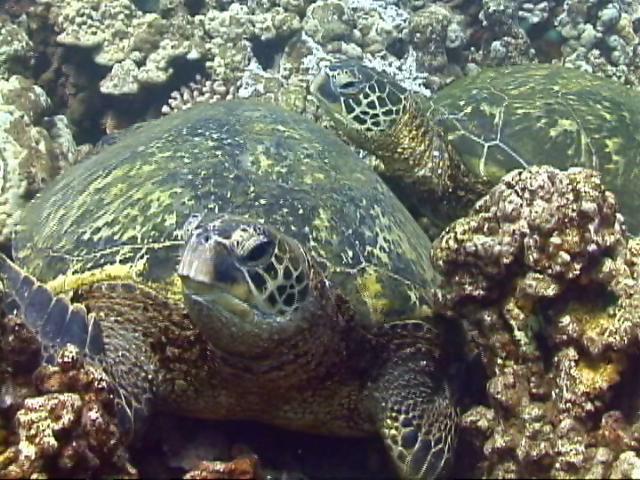 Our regression list now includes twelve male honu compared to three females! We are trying to determine if this disparity is the result of Honokowai hosting more males than females or whether males really do far better than females in recovering from this disease.